It’s awards season, and Atlanta can justifiably boast about its ties to some of this year’s Oscar nominees. But the region has won at least one award that it probably won’t be bragging about. The American Transportation Research Institute has again named Spaghetti Junction the worst truck bottleneck in the country. The trucking industry group monitors congestion at 300 locations across the nation’s highways. It ranked them using GPS data from trucks that showed how slowly they moved compared to the speed limit at each location. The volume of truck traffic was also a factor. Spaghetti Junction’s average speed: 37 mph. Despite its many dubious interchanges, ATRI President Rebecca Brewster – an Atlanta resident – said she sees progress on fixing the region’s highways. Georgia’s $11 billion, 10-year plan for major highway construction includes rebuilding both I-20 interchanges at I-285, as well as express lanes on the Perimeter that may ease traffic at other interchanges. That, of course, is one of the goals of the ranking: To shame governments into fixing problem interchanges. Illinois has begun to fix Chicago’s Circle Interchange (I-290 at I-90), which topped the bottleneck list for three consecutive years. It’s now just the third-worst interchange, behind Spaghetti Junction and New Jersey’s I-95 at SR 4. Spaghetti Junction has now tied the Chicago interchange for most appearances atop the list since 2011. Barring dramatic improvements to Atlanta traffic (and who are we kidding? ), Spaghetti Junction should become the undisputed Meryl Streep of truck bottlenecks next year. The panelists at a seminar on truck parking at the Mid-America Trucking Show last week consisted of representatives from the DOT, law enforcement, owner-operators, and large carriers. These groups don’t generally see eye-to-eye from a policy standpoint, but one thing they do agree on is that “all the money in the world” won’t solve the truck parking issue. It seems so simple; if there isn’t enough parking, build more parking spots. But according to the experts on the panel, that’s not enough. That “right places” bit may be the hardest. Since freight movement and the industry as a whole changes so rapidly, knowing where to put more parking has been an issue. The greatly anticipated Panama Canal expansion for example has the potential to make a major impact on where freight enters the country. According to the Federal Highway Administration’s Tom Kearney, freight shifts like this make it difficult to know where money needs to be spent. Smart placement and plentiful spots won’t help though if drivers must still check multiple locations before finding suitable parking. How can a trucker know when to stop when he’s not sure how long it will take to find safe parking for the night? Should he risk parking where he is, or go over his allowable hours of service to find a more suitable area? To combat this, Will Schaefer of the Commercial Vehicle Safety Alliance says that getting drivers more informed about the real-time availability of spots is key. There are currently pilot programs in some states which let drivers know well ahead of time how many spots are available at upcoming parking areas using signage on highways. States have reported some success with those programs, and they could be expanded nationwide. But unfortunately, even with all of these proposed solutions put together and with all the money in the world, the panelists don’t think that would be enough to solve the parking problem. 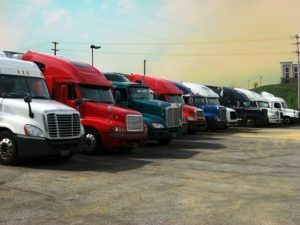 An additional solution was proposed which drivers have been touting for a long time: find a way to encourage shippers and receivers to allow truckers to park at their pick-up and drop-off points. PERRY -- Some large trucks could soon be prohibited from driving through Perry’s downtown. On Tuesday, Perry City Council members held the first reading of a proposal that would ban trucks traveling through the city from using portions of three major streets. The trucks targeted would be heavy trucks such as log trucks, semis and tankers. Trucks involved in business in the downtown would still be able to move through. Mayor Jimmy Faircloth told The Telegraph that the push is to improve safety. City Council work sessions for months have had discussions about large trucks that can’t make difficult turns around downtown, with some discussion of the trucks tearing up the roads. “If we can keep the trucks out of downtown, it will be better for everybody,” Faircloth said. The council is considering prohibiting trucks from Houston Lake Drive, which ties Main Street to Houston Lake Road; a section of Jernigan Street; and a section of Main Street. Trucks would be encouraged to bypass downtown roads including portions of Perry Parkway, Main Street, Houston Lake Road, Ball Street, Golden Isles Parkway, Sam Nunn Boulevard, Interstate 75 and U.S. 41. The measure could be adopted at the council’s next meeting in January. Faircloth said the city is talking to one company that has log trucks making regular runs and will communicate with other companies that regularly bring in trucks. “We have an industrial area in our downtown, so we’re trying to find a happy medium,” he said. Also Tuesday, council members adopted with little discussion an amendment to the city’s new blight ordinance, which creates an appeals process that would be overseen by a hearing officer rather than the mayor and City Council members. Council members also recognized some of the 21 new firefighters who have more than doubled the city’s fire department. The firefighters took up nearly half the seats in the City Council chambers. Some veterans of other departments already are working as firefighters. Others have been trained as first responders and will start fire school next month. In another matter, City Council members were divided on whether city offices should be closed Friday, Dec. 26, as many other local governments are. Faircloth decided to put the blame on himself. “The mayor’s the Grinch,” he said, taking the blame for leaving the offices open. Perry offices will be closed Christmas Eve and Christmas. WARNER ROBINS, Ga. (AP) - Truckers nationwide have railed against a Warner Robins ordinance aimed at banning long-term parking in city lots. Councilman Mike Brashear and other city officials reported recieving messages from concerned truckers from across the country looking to weigh in on the ordinance. City Council Regulates Car Booting Fees Following Complaints From Vehicle Owners Sandy Springs City Council members had considered $40 for all vehicles but approved higher fees, Tuesday night. On Tuesday, City Council approved an ordinance that would regulate vehicle immobilization services and operators. Car booting fees will be higher than the amount proposed in September. The fee for the average car or SUV will be $75. Council members had considered $40 for all vehicles. And $450 for tractor trailers. Council members agreed that higher rates for larger vehicles are necessary to discourage them from parking on local streets. To boot, or not to boot. That is the question in Hapeville. Hapeville’s City Council spent nearly an hour Tuesday night discussing the merits of booting illegally parked cars. The problem area is a parking lot on Virginia Avenue that serves a Motel 6 and a Ruby Tuesday’s restaurant. But adjacent to the lot is Spondivitis, a popular seafood eatery that draws large crowds on the weekends. When Spondivits’ lot is full, many patrons park in the Motel 6 lot and come out to find their cars booted. Hapeville Mayor Alan Hallman said he received more complaints this week about the booting practice in the lot. “I’m just tired of hearing the complaints. We need to resolve this situation,” Hallman said. He said many of the complaints regarded the booting fees, which can exceed $100, as well as the way some of the car owners are allegedly treated by the parking enforcement company. “We do not cuss people out. That’s not how we do business in Hapeville,” Hallman said. But Steven Harper, who runs Georgia Parking Enforcement and has booted cars in the lot, said there are two sides to every story. “We’ve got audio and video tapes that I will gladly show you of how we operate,” Harper said. He said his company routinely boots 50-70 cars a week and most of those occur Thursday through Sunday nights. “I invite any of y’all to come out and watch how we operate,” he added. Another interested party was Nilesh Patel, general manager at the Motel 6, who said he just wants his property protected. “I talked to the people who had the motel before me and he said the parking lot was full of drugs and prostitution. Now, we don’t even have break-ins to cars," he said. The City Council agreed Patel had a right to protect the property, but said a better solution needed to be implemented to quell complaints. “Everything is just too arbitrary with the fees,” said Councilman Jimmy Lovern, who added the city might consider banning booting and just allow cars to be towed. Harper said he would follow the city’s directive, but said the city may receive more complaints with towing. Hallman asked city attorney Paul Koster to review other cities’ ordinances. “We’re having our retreat Saturday morning and I’d like a solution for this problem then,” Hallman said. In our business we also share and lease parking with our business neighbor. Before we took over, people were parking here at all hours and the lot was a magnet for car break-ins drug deals, pimps, prostitutes and their clients, and more problems that just increased our liability and decreased safety in the area. Once we took over and kept the lot cleared (by booting unauthorized vehicles) when it wasn't being used for our business purposes and our patrons, all of these problems were gone. CONYERS — The city of Conyers last month approved an ordinance prohibiting the parking of heavy vehicles on residential property, but some small business owners are finding the law too restrictive. Conyers resident Kamien Toomer addressed the City Council Oct. 18 to ask for leniency on the new law. Toomer owns a single tractor-trailer, which he operates as his business. He told the council that he never parks trailers on his property, but he does park his tractor in his yard when he is not driving. However, he was recently visited by a code enforcement officer warning him he will be cited if he doesn’t move his truck. Three other drivers in his neighborhood were also contacted by code enforcement, he said. Toomer said that his only alternatives are a truck stop at the Pilot on Bouldercrest Road in DeKalb County or a truck stop 45 minutes east in Madison. He said neither of those options is ideal for security reasons or for the sheer distance. Toomer said that The Home Depot has generally been accommodating for over-the-road truckers, but they allow only so many trucks to park in their lots. Toomer explained that the truck driving industry is highly regulated, with strict rules governing how many hours of rest drivers must receive between driving jobs. “I shouldn’t have to waste five hours of my 10-hour break driving around looking for a place to park,” he said. “There has to be some kind of alternative to help out with parking,” Toomer said. City Attorney Michael Waldrop said that the remedy is for truck owners to work out arrangements with local industrial property owners who would be willing to lease space for truckers to park. In fact, one local businessman has responded to this need in the market. Dan Moore, owner of East Metro RV and Boat Storage, has developed a business — East Metro Truck Parking — to help meet the increased demand from truckers who are finding it more and more difficult to park their trucks. Moore said he operates two paved lots that are fully rented by local manufacturers for parking their trailers. In addition, he’s working to lease a 7-acre parking lot in Newton County where truck drivers will be able to rent parking space. Moore said he rents individual reserved truck parking spaces for $150 per month. His lots are fenced with security-coded gate locks and security cameras. Moore attributes the growing difficulty in finding truck parking to increased awareness of zoning ordinances that were already on the books and the increase in the demand for truck drivers. He said he believes the east metro area — particularly Newton, Rockdale and Walton counties — has a high per capita rate of resident truck drivers. Moore said available land in the appropriate zoning for truck parking is limited in Conyers and Rockdale County. In addition, he said, Conyers, Rockdale and Covington require that the lots be paved, which further limits finding appropriate parking spaces. Moore said that finding unpaved land and paying for it to be paved for truck parking would be cost-prohibitive. Moore credits local governments in Conyers, Rockdale, Covington and Newton with cooperating with truckers to help find suitable parking. “They realize they are part of solving the problem,” he said. As technology for trucks improves and use of technology becomes more widespread, Moore said it’s likely the demand for suitable parking will become more intense. Some trucks already have onboard computers that calculate the hours driven and shut the vehicle down when a driver reaches his maximum hours without a rest break. “Truck parking is a horrendous problem nationwide,” he said. Editor Alice Queen contributed to this report.